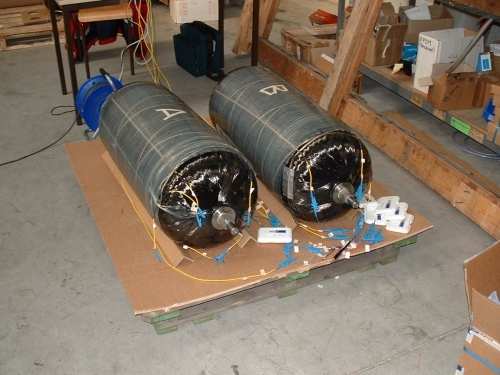 An all-composite CNG tank consists of one liner wrapped in hoop and longitudinal direction with structural carbon filaments. In order to allow labeling and to offer better protection of the external surface, a protecting layer with glass fiber reinforcing is added. In this particular project, thermoset matrix was used. The use of an all-composite tank reduces the weight of tanks from 400 kg (stell tanks) to 40 kg, but also requires regular inspection. The ZEM project addresses the development of a monitoring system to verify the integrity of composite high pressure tanks for natural gas or hydrogen. Stationary and mobile applications are considered and a demonstrator related to vehicle propulsion will be developed. 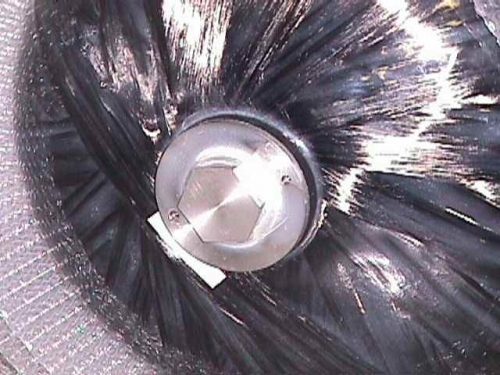 Currently proposed inspection techniques of composite vessels involve off-vehicle visual inspection and pressure testing which is labour intensive and requires expensive equipment. The proposed approach, based on fibre optic sensors, facilitates simple but detailed evaluation of the structural integrity, monitored on-line during tank refuelling. 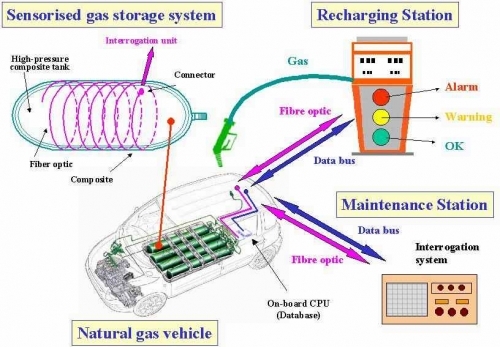 The aims are to eliminate the requirement for periodical inspection through different levels of monitoring on-board, at the refilling station and at the garage.The project focuses in particular fibre optic sensors and their embedding in the material, composite tank manufacturing, signature recognition algorithms and interrogation methods.The sensors are embedded between the last carbon layer and protection layer, and the SOFO system was used. Cucurrent status: Sensor based on SOFO technology, embeddable in composite material succesfully develloped, applied and tested. 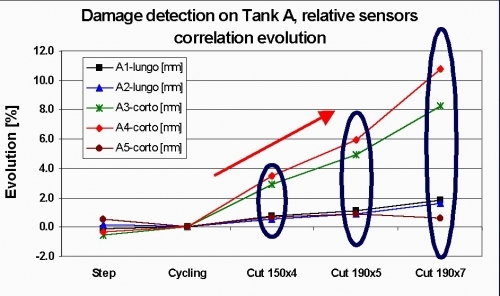 Sensor topologies for damage detection succesfully developed and tested. Algorithms for damage assessment successfully develloped and tested.